My mind plays tricks on me. I have a memory so surreal and important that I doubt myself that it ever happened. Whenever I am in doubt about why I do what I do, or have an existential crisis, or have to give an answer in an interview, this is the memory I go to. And yet, it is so unbelievable to me that a few weeks ago, I had to ask my mother whether or not this really happened, or whether I made it up in my mind because I wanted it to be true. What was it? 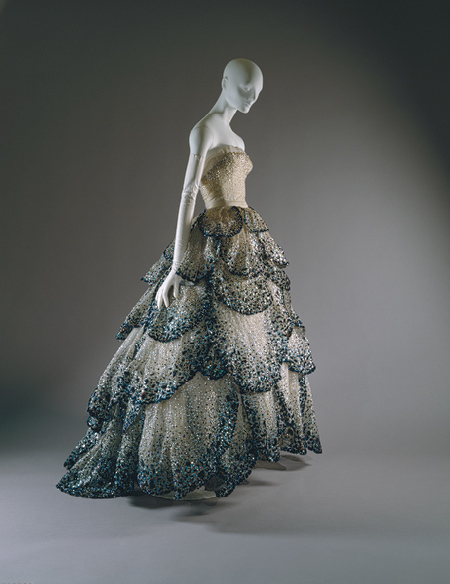 An original Dior “Junon” Dress, the fourth and final one ever made in 1949. Was the memory real? “Absolutely,” my mother reassures me. She even gave me the background story. Claire Newman was a character, to say the least. The staff at the museum kept an extra beer in the fridge because she had beer with lunch, this was standard. She was born Claire Poe in Florida, and grew up as a statuesque debutante with blonde hair and long legs. She was featured on the cover of “Life” Magazine during war time to cheer up the troops. It is on this magazine cover that New Orleans’ own Robert Newman found her and knew he had to marry her. She moved to the crescent city where she fit in with its’ easy, wild antics like she was born there. 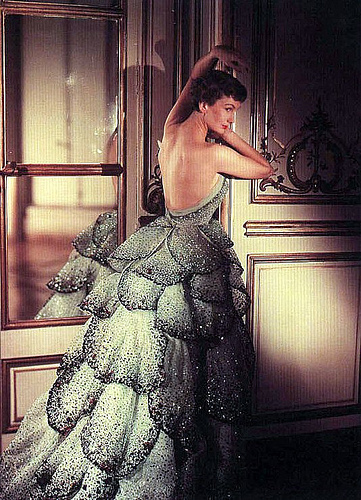 She was a very good client of Christian Dior and when she saw his Junon dress, she knew she had to have it. He made four Junon dresses total, and swore that he would not make another. They were intricate and couture, with thousands of hand sewn beads. Claire begged and begged and wore him down. He said that he wasn’t willing to make another dress, but that if she fit into the sample model, she could have that one. As luck would have it, she did. I like to think that she wore it to the Rex ball that year and “out shined” the queen, but I have no such confirmation. She was known for asking Dior to re-make his fashions for her, and not just things she saw on other people and coveted, but things from her own collection that would get ruined or disappear during her shenanigans in New Orleans. One story involves the fairgrounds and a certain black velvet Dior dress in which she “raced” on the sandy track after throwing back a few too many at the races. The Junon dress is still as relevant and beautiful as it was in 1949 and has been re-invented by John Galliano in his 2010 Spring Couture collection and by Zuhair Murad for Miley Cirus for the 2009 Oscar Awards. And it is why I create beautiful things. I think beauty is healing and I think beauty makes you feel more alive. There is something about using the energy that is in my hands to create something. I prefer to sew by hand with incredible intent and detail rather than sending a simple design off to be mass produced by a manufacturer. And I think it all started with this dress. Actually, I know it did.